This is it. The end. Does it finish with a bang or a whimper? Has Adrian saved the world or doomed it? Back in Adrian’s strong hold, Dan is also trying to comprehend what has happened. The difference in these two men is evident. From day one Adrian has been looking at the big picture. He’s planned it all down to the little details. Dan on the other hand can’t understand how any one man could think on this scale. The heroes try to attack Adrian, not only finding themselves outmatched, but reminded that “Failing to prevent Earth’s salvation is [their] only triumph”. For the destruction of New York has created world peace. The nations have banded together to defend themselves against this “extraterrestial” threat. War is no longer an option. Adrian has saved the world. At this revelation, the fighting stops. Dan and Laurie are at a loss. It’s all too big for them. They can’t bring Adrian to account for his crimes as it would bring all the good it has brought crashing down. So they just stop. They don’t know what to do. Rorschach, on the other hand, has never dealt well with gray situations. He can’t compromise. He can’t allow Adrian to get away with this. Even if it means plunging the world back into war. He knows what is right. And he knows what is best. They aren’t the same thing. If Jon hadn’t killed him right there, I doubt Rorschach’s brain could have coped without shutting down. The moral ambiguity of what has happened is too much. The day has been saved. Or has it? As Jon points out to Adrian, “Nothing ends, Adrian. Nothing ever ends.” Adrian has saved the day. For now. The day will need saving again. He has averted war, but done nothing to do away with the causes of war. This is a temporary solution at best. And to be honest, the 21st century has shown us that Adrian’s plan probably wouldn’t have worked in the first place. The terrible events of September 11, with the destruction of the World Trade Centre is not that much different to an attack by an alien squid. Did the world join together in solidarity against a common threat? No it didn’t. If anything, the world is a less safe place because of it. The most telling scene is the final page. An intern at the New Frontiersman hovers over Rorscach’s diary. Inside is enough evidence to send everything crashing down. What happens next? We don’t know. And that’s a good thing. We are reminded that there is no such thing as happily ever after. Nothing ever ends. Will the truth stay hidden? Or will it come blurting out? We will never know. Because there is always something that comes next. The day will always need saving again. That is until the final day. The day when Jesus returns. The day when he comes back to deal with sin once and for all. To fully usher in the kingdom of God. To bring about the new heaven and new earth. He will wipe every tear from their eyes. There will be no more death or mourning or crying or pain, for the old order of things has passed away. (Revelation 21:4) On that day there will be no more fear for the future. There won’t be any threat of the truth unravelling everything. For all deceit and sin will be done away with. All our enemies will be gone. All that will be left will be God’s chosen people worshipping him and loving each other. There will be no need for superheroes because the day will never need to be saved again. Bring it on! Did you catch the hidden squid in the movie? The moral ambiguity would have been too much for Rorschach? I doubt it. The moral situation is clear; Adrian killed millions of innocent people, and thou shalt not kill. It’s pretty cut-and-dried. “Ah, but for the sake of world peace!” some would protest. It doesn’t work that way, and we set ourselves up as gods if we try to judge from that perspective. Adrian ~thinks~ he worked out this plan to the tiniest detail, but he didn’t; he doesn’t know the number of hairs on his own head, much less the fate of “world peace.” It is not his place to make these kinds of decisions. Rorschach had the humility to understand this and to understand his proper place in the world. Dan and Laurie, while both far more moral than Adrian turned out to be, still harbored enough pride to think that maybe this “greater good” nonsense had some merit, as though they could ever determine such a thing. Thus their hesitancy to stop Adrian. As for Jon– I suspect he was secretly embarassed that Adrian had been first; Jon had never formulated something so diabolical. So what does he do? He leaves Earth for good. He takes his big red ball and stomps away. He doesn’t hang around for the tough work that is sure to follow. He dresses all this up in flowery talk, but don’t be fooled. He’s no different from the elves leaving Middle Earth during the return of Sauron; when the going gets tough, the beautiful people leave town. Only Rorschach– tough, smelly, obstinate, awkward Rorschach– has the nerve to recognize Adrian for the monster that he is. Rorschach, keep in mind, was the only hero who kept heroing after it had been outlawed. He was the only one who wasn’t in it for himself, who wasn’t a little bit of a peacock. Rorschach continued to be a hero because it was the right thing to do, no other reason. Guys like him are rare. Dan and Laurie, by the way, consciously recognized the need for self-sacrifice, but they didn’t feel this need in their hearts as strongly as a true hero would. Dan makes a brief calculation in this chapter– tell everyone the truth and doom the world, or stay silent with this horrible secret, carrying this weight around for the sake of world peace? His rational brain defaults to the self-sacrificing decision of staying silent, because self-sacrifice is what a hero is supposed to do. But this is a delusion, and falsely raises a person to godhood status as I discussed above. They didn’t sacrifice something of themselves for world peace, they smothered their consciences and let a killer go free. Rorschach possessed the simplicity and moral clarity needed to avoid such a mistake. 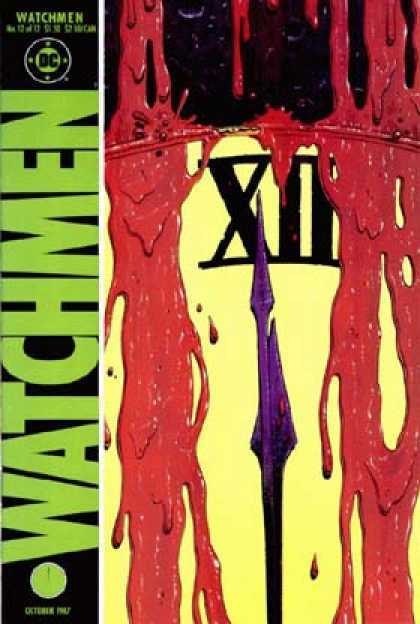 Watchmen is a good example of why God gave us law. Law shows us the way even when our rationality is overwhelmed. Was Rorschach a hero because it was the right thing to do? Whose idea of right and wrong was he upholding? He’s a violent murderer, hates women, and thinks the whole world is out to get him. Just because he acts out of a sense of right and wrong doesn’t mean that he is right. When he leaves Adrian’s base, he screams at Jon to kill him. He’s not calling Jon’s bluff. His mental frame work is unable to cope with what has happened. Not one of the “heroes” in Watchmen are innocent. Almost all of them try and impose their own moral code on the world, some more successfully than others. But unlike God, none of them are in a position to do so. No, Rorschach is a hero. He is a deeply flawed man, but so are we all. I agree that he was having trouble coping when Jon killed him, but what he was not coping with was the enormousness and the enormity of the crime he’d just witnessed. It didn’t help that Dan, his closest friend, was willing to go along with this crime. This is not the first time that stark depravity had rendered Rorschach a little unhinged; the girl-eating dogs he’d discovered several years back was something he never got over. What does this say about a man that he would be hurt so deeply by such things? After all, the dogs hadn’t eaten ~him~, and he hadn’t died in the Manhattan attack, either. Why would these trouble him so deeply? What I see in Rorschach is tremendous empathy. He knows what pain is (due to his abusive mother), and he feels it keenly when he sees others suffer. Rorschach is not a saint, and his methods are imperfect. But again, this is true of all of us; we all fall short of the glory of God. He’s willing to break fingers to get vital information, and a perfect person wouldn’t do that. The handful of deaths he’s caused were all under extraordinary circumstances, and in most cases were clear self-defense. Again, he’s not perfect, and neither are you and I. But who would you rather have guarding you at night, Rorschach or Adrian? Rorschach will defend you to his dying breath; you may not like this man, but you can trust him. Adrian, meanwhile, will cook up some reason why he must smother you in your sleep. And whether he was conscious of it or not, it was Rorschach who was following God’s law at the end of the story. The ideas of right and wrong he was upholding were God’s (to answer your question). He was a flawed man following God impefectly, but still he followed, and he’s the only one in the story who did. He was also the one least equipped to do so; child abuse had left him horribly damaged, while the others were relatively intact. God gave Adrian everything, and Adrian spat in His face. God gave Rorschach almost nothing, and yet Rorschach sought goodness right up to the end. If Rorschach wasn’t heroic, I don’t know what heroism is. You’ll have to reacquaint me with the part where Rorschach hated women, I don’t find that in the story.